The Robert Allen Al Fresco Outdoor Drapery Hardware Collection is a beautiful interpretation of hardware created and manufactured primarily for outdoor applications. This 8' drapery rod, in a classic black finish, is a part of that collection and provides the perfect element needed to complete your outdoor living space. All finishes of the Al Fresco collection are powder-coated for outdoor performance and are rust resistant. 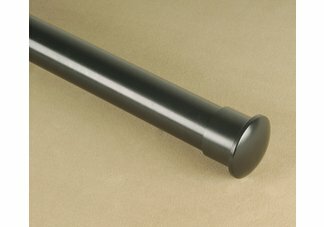 Because this rod is 1" in diameter with an 8' length, it presents the ideal size for any outdoor purpose. For longer length poles, we recommend a Connector and an additional bracket for support. 8 ft drapery rod: Maximum 2.65 lbs per foot of drapery panel weight. Additional Information: Rust resistant, powder-coated finish for outdoor performance.